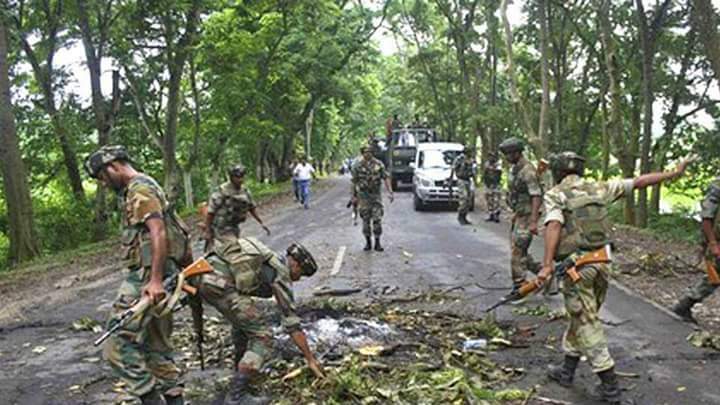 Suspected militants ambushed a convoy of 16 Assam Rifles on Tisa-Wakka road in Longding district of Arunachal Pradesh, 160km from Tinsukia district, yesterday, leading to the martyrdom of at least one jawan and injuring nine. Confirming the development, the GOC of Dinjan-based Dao division, Maj. Gen. Ananta Bhuyan, said one jawan had been martyred while nine were injured. "Two are in critical condition," he added. The entire area east of Tinsukia upto the China border on one side and Myanmar on the other falls under the Dao division in Upper Assam's Tinsukia district. Sources said the slain jawan has been identified as rifleman Shree Bhagwan. The injured soldiers - deputy commandant of 16 Assam Rifles D.K. Chauhan, N.S. Konyak, M. Lotha, Pawan Kumar, Bharat Mehran, Amrit Bahadur Ghising, Venkatesh, Bokama Somi and L. Mante - have been admitted to Dinjan army hospital in Tinsukia district. Guwahati-based defence spokesperson Lt Col Suneet Newton said the encounter took place at 1.30pm while the convoy was on routine patrol. "Militants had planted an improvised explosive device (IED) on the road. When the IED exploded, the convoy stopped. Then the militants fired indiscriminately, killing one jawan," a source in the army said. The Assam Rifles team retaliated but the militants fled, taking advantage of the thick forest. Additional forces have been rushed to the area for combing operations. Sources said the NSCN (Khaplang) is suspected to have ambushed the convoy. Cadres of the outfit use Longding, the newly created district of Arunachal that borders Myanmar, as a corridor to reach their camps in the neighbouring country.